These Blueberry Coconut Muffins are a wonderful, healthy creation of mine. Kids will love them too! I used freshly ground white whole wheat flour, maple syrup, Bob's Red Mill Flaked Coconut, pumpkin pie spice, coconut oil, flax eggs, almond cream and frozen blueberries. Bob's Red Mill carries a coconut with larger flakes and they work very nicely in this recipe. Only $3.11 for a 12 oz. bag on iherb. 1.) Preheat oven to 350 degrees Fahrenheit. Use 8 regular sized cup cake holders or 4 large ones (like shown). 2.) Put maple syrup, coconut oil, vanilla in blender and blend well.. Add flax eggs and blend for 1 minute. 3.) Add almond cream to liquids and set aside. 4.) Mix flour, salt, spice, baking powder and baking soda together. 5.) Add liquid to dry ingredients and mix until all flour is incorporated. 6.) Gently fold in coconut and blueberries. 7.) Pour into muffin holders until 3/4 full. 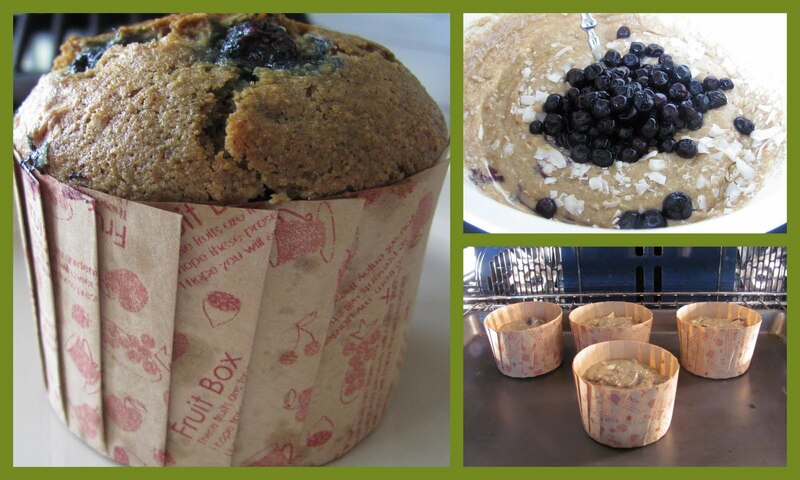 If using just the muffin tins without containers, brush lightly with coconut oil before adding batter. 8.) Bake for 25 minutes or until toothpick inserted in center of muffin comes out clean and edges are golden brown. SOunds like a VERY delicious combo!!!!! Can you just sell them over the internet so I don't have to go to the trouble of making them myself? I know I would too. Try to figure out a fair price and open a Paypal account. Let's get moving! Those are really lush look muffins. Coconut and blueberries sounds like a winning combo to me! My mom has made these regularly four years. They are amazing! !